The description catches your eye. Rye is not an easy flavor to like. All kinds of images of amber moonshine spring to mind. Still a play on the classic Manhattan cocktail is as evocative as Marilyn Monroe’s sultry rendition of Happy Birthday. You order and turn your attention back to the conversation at hand. That is, until the server returns with a tray. She lays it down with two fist size lowballs adorned with double black diamonds. You don’t even catch the irony of the design since you haven’t been skiing in a while. But that will be the last time you inhale the spring air of the interior of Monsoon East, a Vietnamese restaurant in Bellevue, WA. Guests are invited to pour their own cocktail straight from the apothecary jar. Instantly you are on the other side of the drug store counter. Guilty but fun. And then the reveal. 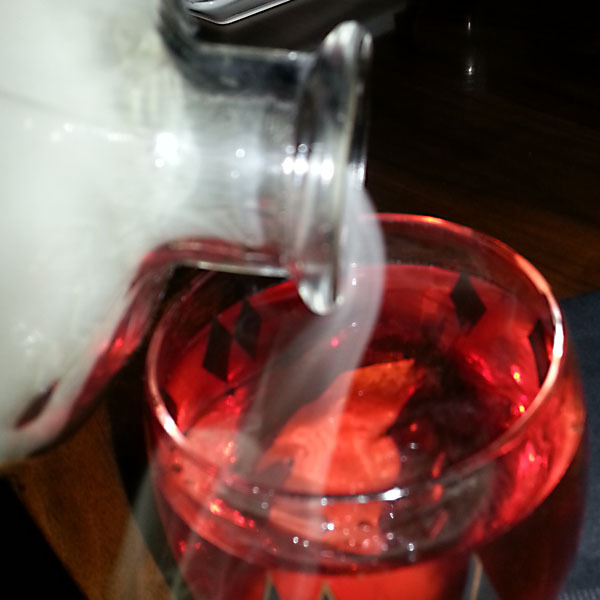 What appears as a cloudy vessel is indeed a rye cocktail underneath a fog of smoke. It was all too easy to lift the knob and release the jeanie. The liquid dances its way into the glass as you tilt. It slides down the ice chiseled from the block. The smoke tumbles out since it’s made from chilled air and is heavier than the room’s atmosphere The smell of campfire travels up the nose. A lift to the lips. Sip. And then you vanish. The cancelled plane. The fighting kids. The overdue reports. All are no longer in your mind. You open your eyes and scan the interior of a sheikhs tent. Or in a cabin just below the treeline. The moon hangs just above the horizon. You reach for the travel pack and head into the night air. This is the power of creativity. This is the power of an artisan who conducts sensory magic to transform the ordinary into the unexpected. 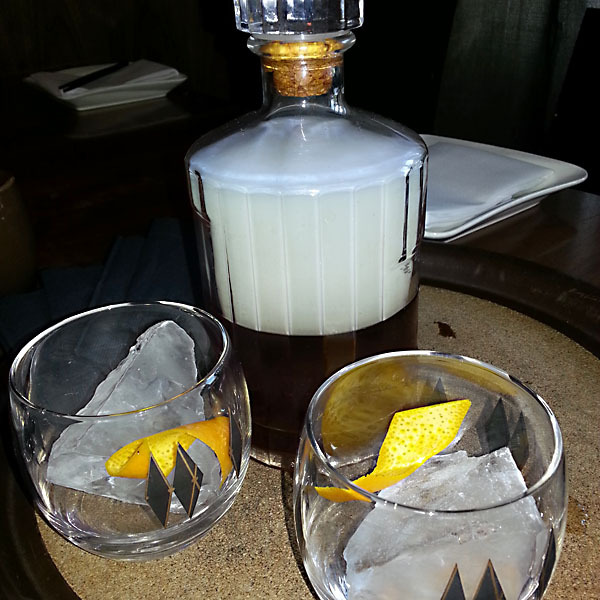 We can thank Jon Christiansen, Bar Manager for Monsoon East, for providing this potion. The cocktail itself contains a Jamaican Rum, an obscure apertif from Piedmont and the booze made famous by John Mclean’s American Pie. This is a tapestry of flavors unified in purpose and harmonized with a puff of smoke. This is a cocktail that whispers into existence images of travel and intrigue. And it will forever haunt my memory.